All of us know that tutoring and mentoring relationships don't happen in a bubble. This month's Strategy of the Month author gives us a way to prevent any sense of a bubble from forming. Meet Amber Jones, a coach with IUPUI's America Reads and America Counts Programs. An undergrad Social Work major, Amber took a strategy out of a professional social worker's toolkit and applied it beautifully to her tutoring practice. The strategy involves creating an "eco-map", a great tool that volunteer tutors and mentors can use to better understand their student or mentee's overall attitudes towards life and school, as well their home environments and family relationships. When we asked Amber the reasons she coaches, she shared that, "Getting paid to hang out with kids has always been something I look for in part-time employment. Tutoring graciously reminds me how tough it was to be a kid. Without even seeing the statistics, it has always been easy to tell that our interactions with students benefit them in one way or another. I love this job because it is a chance to give new perspectives to those who might feel stuck inside the box." We hope Amber's strategy will give you a new perspective on how to build closer relationships with the children and/or adults you serve. Situation: I find that the students have very complex family arrangements that may lead to stressful environments. This, in turn, affects learner attitudes and emotional health while at school. With an eco-map, you can better understand what the learners' home life is like as well as their interactions with micro- mezzo- and macro- level social systems. Eco-maps are a useful tool for social workers and coaches alike since trust is such an important aspect of working with kids. Getting to know your student is the first major step toward building that trust. Step 1: First, I prepared my own eco-map to share with the student (click the image below to download and print out a sample). I illustrated my connection to social systems such as my family, school, and work with circles, squares, squiggly lines, and dashed lines. Then, I explained why I chose the connections such as a darkened line toward working as a reading coach. Since I enjoy working as a coach, the line connecting me to my job was clear and dark. Step 2: Second, I gave the learner a sheet of paper with a lightly drawn circle about 2 or 3 inches in diameter. With a pencil, the learner draws a smaller circle or square (circle for girl, square for boy) with his or her name in it. The rest of the lightly drawn circle should contain everyone else living in the learner's household including pets (note that your learner can add "ears" to those boxes containing pets' names). Step 3: When the central circle of housemates has been established, the learner should list other people the parents or guardians are involved with such as spouses in separate households or blood relatives living outside the home. For instance, Mom's boyfriend has two kids and lives in his own home. This would be illustrated by drawing a line from Mom in the central circle connecting to an additional circle containing the boyfriend with his two kids. Maybe the learner draws a squiggly connection because the Mom and boyfriend don't always get along. Types of connections should be noted in a key (see the key at the top left of the attached example to get an idea of how different line types in the eco-map we made represented different things). Write "school" or the teachers name in another area of the page and connect the student to this new bubble with an appropriate line. For example, the student really connects with their current teacher or coach. S/he would write "Ms. Jones" on an area of the page surrounding the central circle and connect "me" with "Ms. Jones" using a darkened line. The key would note that the darkened line equals a strong connection. Step 5: Using any other places, people, or organizations the learner is involved with, illustrate how the learner connects to his or her social environment. More examples might be afterschool daycare, babysitters, favorite past times, vacation spots, grandparents, best friends, cousins, jobs, chores, clubs, sports, coaches, classes, or major fears. Once your learner creates his eco-map, spend some time with it to consider how you'll use this information right now and what additional information you need to learn so that you can better serve him. 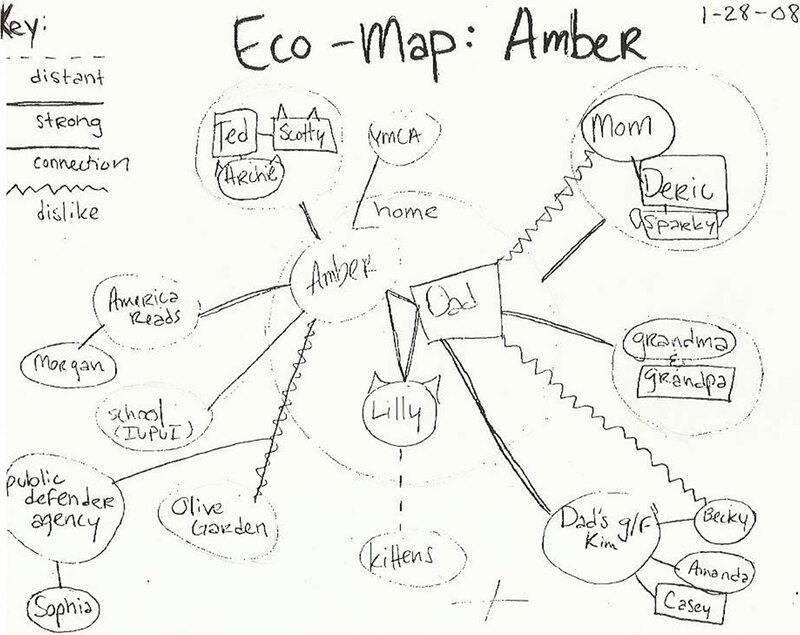 If you made an eco-map of your own relationships to share with your learner, ask him if he has any questions about the relationships in your life. Remember that this map is just a snapshot of your learners' present relationships. Think about whether and how you'd like to update the maps or your knowledge of your learners' relationships as you continue to build a relationship. Please share your thoughts about this strategy and any messages you have for Amber by clicking the grey “Comments” link below.